I know this seems like a lot of documentation, however you want to prove that your child is "employed/working" and you are not just handing them money and calling it a business expense. When our children were younger and living at home, I paid them weekly with my business account checks for chores that they did for me daily. 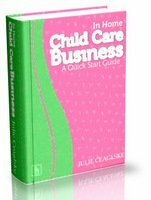 I had a list of chores I needed them to do – like vacuuming, dusting, cleaning daycare mats, bathrooms, etc… things that pertained to my daycare business. This was a very detailed and documented list that when the task was completed they checked it off. They had to earn the money. If they didn’t work, they didn’t get paid. I kept these lists in my tax documents and was able to claim these payments as a tax deduction. I was able to pay them (at that time) up to $600 per year. With all this being said please consult your accountant/tax person on the laws in your state. I know that they all vary and I want you to do what is legal in your state. Thank you for your question and best of luck! Join in and write your own page! It's easy to do. How? Simply click here to return to Child Care Tax Deduction.